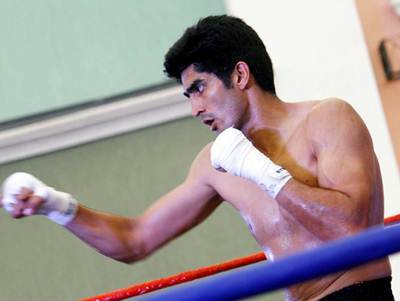 The Punjab and Haryana high court on Friday issued a fresh notice to boxer Vijender Singh on him joining professional boxing. The notice, returnable on August 20, was issued by a bench comprising Justice S K Mittal and Justice H S Sidhu. Taking cognizance of the news published in the media with regard to his decision to turn pro and join the Queensbury Promotions boxing league, the court had earlier issued notices to the state of Haryana and Vijender for July 24, terming the action of the pugilist as being against the sports policy. During resumed hearing of the matter on Friday, the Additional Advocate General, Haryana, appeared before the bench and sought three weeks’ time to file a reply. As the notice earlier issued through the DGP, Haryana, to the 2008 Olympic bronze medallist boxer was not received back either served or unserved, the bench issued a fresh notice to him for August 20. The Haryana police had recently warned of taking action against Vijender if he failed to seek permission from the state government to turn professional. The boxer was made DSP by the Haryana government after winning a bronze medal at the 2008 Beijing Olympics. Vijender is currently on probation and yet to complete his training. Being a government employee, he cannot accept another employment or accept remuneration from any other source without the government's permission. Image: Vijender Singh during a live training session at the Phoenix Market City Mall in Kurla, Mumbai.